Here at the Children’s Discovery Centre, every child will find experiences that will awaken their curiosities and engage their creativity. We’re only open until December 31st, so visit today! The art experience at the Discovery Centre will be that of a dynamic playground, designed as a large-scale installation where children will discover and learn the magic of creativity. The role of materials and how children explore them and integrate them into their conceptual world is at the heart of building this creative knowledge. 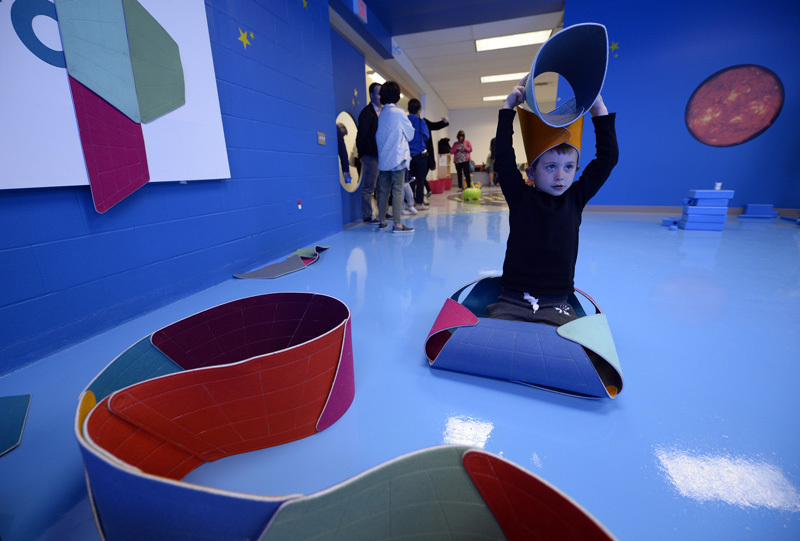 Set on the surface of the moon, and illuminated by the glow of the earth rising and the solar system swirling, children will discover Feltro, an interactive construction tile system made of magnetized felt. Imagination Playground was conceived and designed by award-winning architect David Rockwell to enable children to control and create the world around them through collaboration and physical activity. Run! Ride! Play! The City streetscape will recreate the city especially for our youngest Torontonians! Kids will ride bikes, trikes, scooters, wagons, and more through a kid-sized version of downtown Toronto streets. Safely cross the street to the construction zone complete with gravel pit, pylons, and safety gear to help build a new Toronto! Children and adults will have the chance to explore a real campsite in the Ontario wilderness. Feel what it’s like to climb into a canoe or build a campfire; use your magnifying glass to examine forest insects, creatures, and animals; walk along logs and rocks to return back to your campsite and pitch a tent. Storyland is a bright, fun library reading room with creative design and few distractions where children can explore and discover letters, words, and stories. 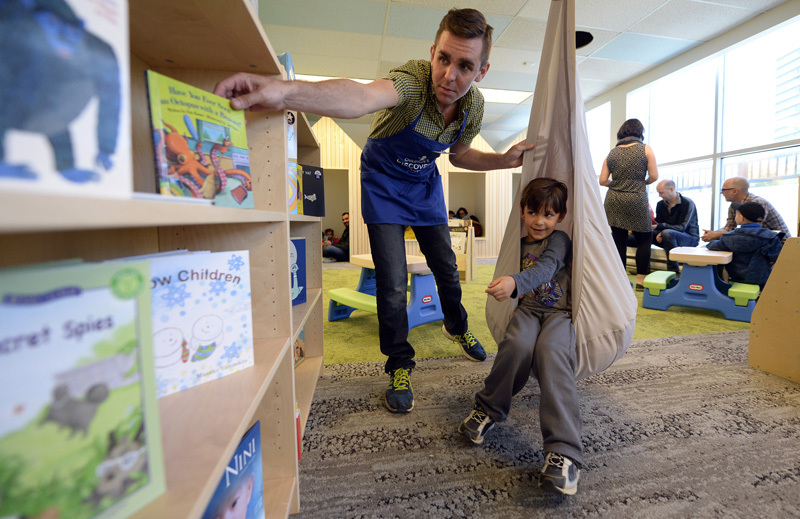 It will be a space where parents and caregivers can come with their kids and spend some quiet and quality time with their children and help them develop a love for reading and books. It’s time to make some noise! Discover how sounds make music, and how music makes you feel. This is a space for all children to touch, bang, and shake instruments and household objects, creating sound and rhythm. Here kids can use music to explore different emotions, moods, parts of the world, different races, and different cultures. Enter a world of imagination and creativity. The starting point is to figure out the story they want to tell: can it be created on the spot with other kids, their parent, or the facilitator? What happens in the story? What are the characters? What do they look like? Are there props? Do we have them, or should we make them? What happens next? Pet Vet is a child-sized replica of a veterinary office filled with the tools and equipment vets use to keep our animals healthy. Children will be able to make choices about the best way to groom and care for their pets: an ideal place for children to learn how to take care of the world around them! A robust experience of the senses: colourful, action-packed, fun and very interactive! Food is the fuel that our bodies use to stay healthy, active, and energized, and children will be able to explore with all their senses; touch, smell, see, hear and taste as they learn The Art of Playing With Your Food! Eat Street Includes: A Demo Kitchen and Teaching Lab | Marketplace Grocery Store | Interactive Rainbow Wall | Mini Kitchens for our Mini Chefs! 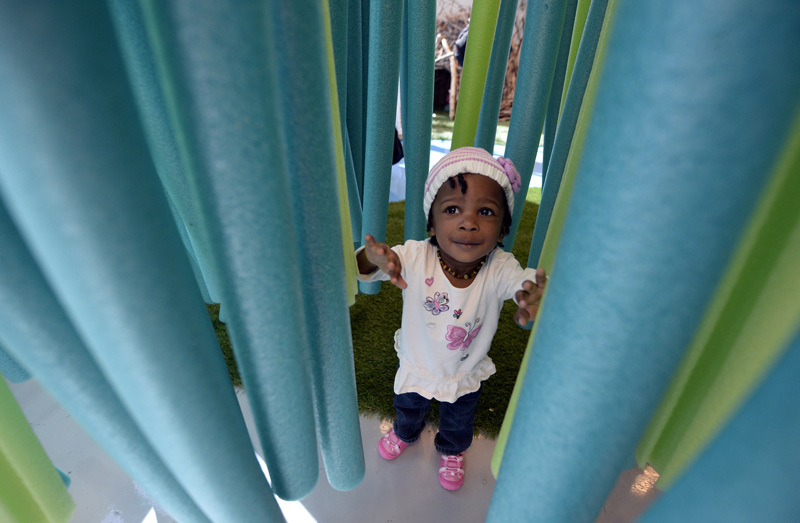 The enclosed and shoe-free First Discoveries space has been designed exclusively for our youngest visitors. With lots of tactile elements to encourage motor development, tots can inch, crawl, and roll their way around the softly carpeted floor as they explore the world around them. Foam blocks, climbing structures, and interesting murals will encourage cruising, walking, and independent movement, which will give Toronto’s newest parents a chance to connect with one another. Great for keeping the Discovery Zones clear of any wheels not driven by the kids! Unmonitored: take valuables with you. A clean area with tables/chairs/highchairs for your crew to park while you break out your own packed lunch. Plus a hidden "discovery" from our friends at Sago in the wall. Note: We currently do not provide any food for sale. The Children's Discovery Centre can get loud (as it should! ), so when you and your charge need a break to feed or just rest quietly, privacy and some tranquility is found in either of our quiet rooms. Both feature a couch and comfy chairs. Plus we also provide very clean washrooms with hooks, change tables and diaper disposal.